Mailchimp is one of the most popular and amazing mass emailing solutions that you can use for free for up to 2k contacts and 12k emails per month (check detailed pricing here https://mailchimp.com/pricing/). With Dynamics 365 users can use marketing lists to group leads or contacts or accounts manually or according to specific criteria when querying customer data using Advanced Find. Marketing lists can be linked to a marketing campaign which is a native feature as well. When it comes to bulk email and unless you already have an integrated marketing automation solution like Clickdimensions you cannot use Dynamics 365 for Sales. Users should export customer data and import them in their mass emailing tool (which can be mailchimp, mailjet, atompark, sendpulse,…) before sending them emails. That means you will have customer database in 2 different solutions without automated synchronization nor stats retrieved in your CRM system. 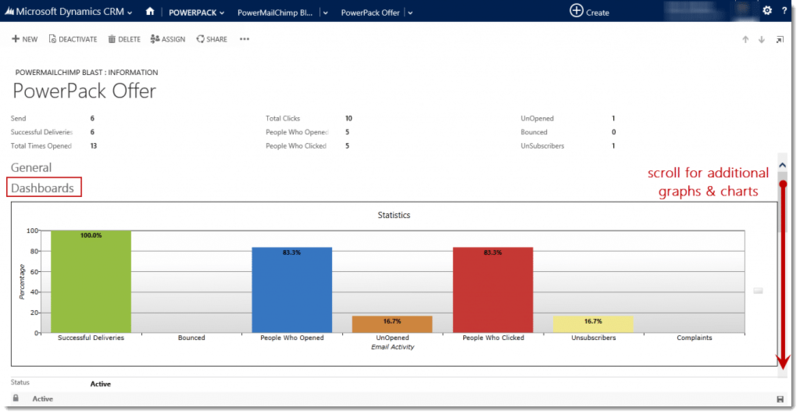 PowerMailchimp is an addon, a Dynamics 365 solution package to import, that I’ve been using (This addon is developed by PowerObjects, an ISV that has several other amazing and useful addons). It makes it easy to sync your Mailchimp and Dynamics 365 lists and send directly bulk email without leaving Dynamics 365. Stats (Successful deliveries, opens, clicks, etc..) are also synced and can be used in your Dynamics 365 charts and dashboards. Mailchimp: Free up to 12k emails per month for a 2k contacts databse. See pricing above. Powermailchimp: 2$ per month. Price is per user, per month. All enabled users are automatically counted. This includes read only users, admin only users, and service accounts. If you plan to use Mailchimp with Dynamics 365 you can get a 30 days free trial of that addon here. You can also find the user guide in that page so you can import the solution and follow some few steps to set the synchronization.